Miles of unspoiled, rugged wilderness lay before us, as far as the eye could see. Hauled out on a frigid rock beach, a herd of walrus called out occasionally, but were mostly content to bask in the afternoon Arctic sun. The blazing red tundra was surprisingly soft beneath our feet, in stark contrast to the razor sharp lines of towering mountains and weathered icebergs, as far as we could see. The best part of it all? My son Owen, just 9 years old at the time, had joined me on this epic Arctic adventure. Together, we had the time of our lives and learned firsthand exactly why Spitsbergen is known as the Wildlife Capital of the Arctic. Passengers hike the fertile Arctic tundra on a gentle incline and enjoy the views of Spitsbergen on their way to the top. Spitsbergen may be your top choice for the ultimate Arctic adventure, too, but where should you visit, and what time of year should you go? In this blog post, I’ll share answers to some of the questions we’re asked most often about when to visit Spitsbergen and where to go while you’re there. I’ll also share my own experiences visiting this pristine island in the Svalbard archipelago, to help you plan the trip that best suits your own needs. Which parts of Spitsbergen can I visit on an Arctic expedition? This Norwegian archipelago lies between mainland Norway and the North Pole, making it one of the northernmost uninhabited areas on the planet. Exploring Spitsbergen by small expedition ship gives you the opportunity to explore the island’s biodiverse coastal areas, icy bays and inlets, and fascinating historic sites and towns like Longyearbyen. Depending on the itinerary you choose and the route your expedition takes, you might visit and hike vast wilderness areas like Northwest Spitsbergen National Park or South Spitsbergen National Park. You’ll explore stunning fjords by Zodiac, possibly cruising beneath the massive bird cliffs at Alkefjellet, or stopping to photograph the 14th of July glacier. You could visit an area like Hornsund, a preferred hunting area for the island’s massive polar bear. Spitsbergen passengers enjoying the optional kayaking program encounter a massive wall of ice in the their travels. You can choose your own adventure and see Spitsbergen in a whole new light with optional activities like kayaking or snowshoeing, too. What’s the best time of year for Spitsbergen travel? We visit Spitsbergen in June and July, when the sea ice is still thick and offers the region’s polar bears a fertile hunting ground. This gives you the best chance of spotting one on your expedition. A polar bear and her cub spotted in the Arctic summer in Spitsbergen by Quark Expeditions passengers. In the Arctic summer, the tundra can be incredibly colorful, all kinds of wildlife are active, and you might also see whales on their migratory routes or feeding around the island, as well. 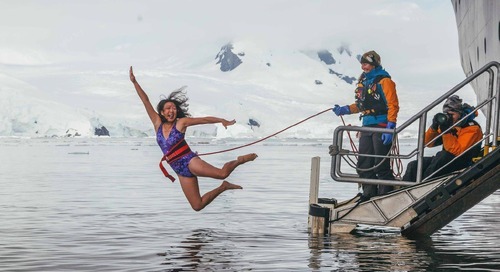 What’s it like exploring Spitsbergen by small expedition ship? There’s one rule of small expedition ship travel: expect the unexpected. Throughout your journey, your Expedition Leader (EL) and ship’s Captain are constantly working together to get you to the most interesting, spectacular landing sites in the safest way possible, given the sea and weather conditions at the time. Expedition team members are always on the lookout for land and marine wildlife, from the whales that inhabit the waters surrounding the island to the elusive and majestic polar bear. How do I choose the Spitsbergen expedition for me? Spitsbergen is a destination in its own right, but might also be one area visited on an expedition like Three Arctic Islands: Iceland, Greenland, Spitsbergen. If you’re short on time, pack all of the excitement into a condensed timeframe with the 6-day Spitsbergen Highlights: Expedition in Brief. Where scheduling isn’t an issue and you’re craving an in-depth exploration of the area, itineraries like the 13-day Spitsbergen In Depth: Big Islands, Big Adventure or 11-day Spitsbergen Explorer: Wildlife Capital of the Arctic fit the bill. 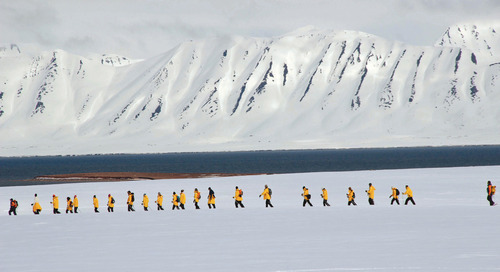 Spitsbergen Explorer passengers traverse an icy inlet by Zodiac, on the lookout for polar bears, hauled out walrus and other wildlife. If you have your heart set on spotting polar bears, don’t miss the specialized Spitsbergen Photography: In Search of Polar Bears expedition in 2018. While many people book their Arctic expedition far in advance to take advantage of early booking bonuses, it’s never too late to make your Spitsbergen trip happen. 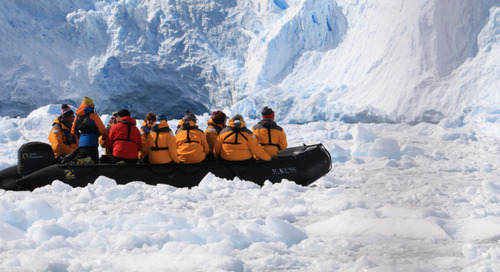 In fact, you can enjoy last minute savings on some Arctic cruises. Want to learn more about visiting Spitsbergen? Explore this Spitsbergen guide and learn all about the wildlife capital of the capital, how to get there and which activities options will complete your Arctic adventure!